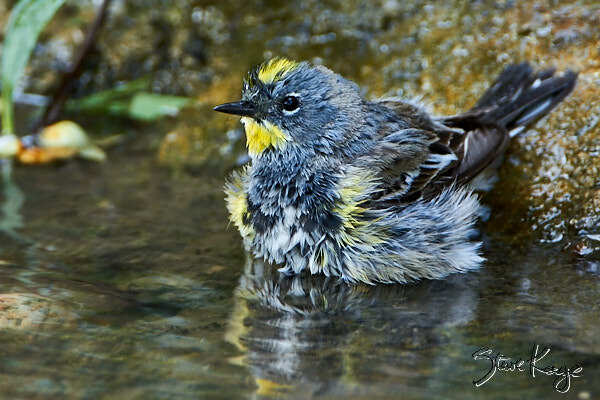 So today we celebrate wet warblers. 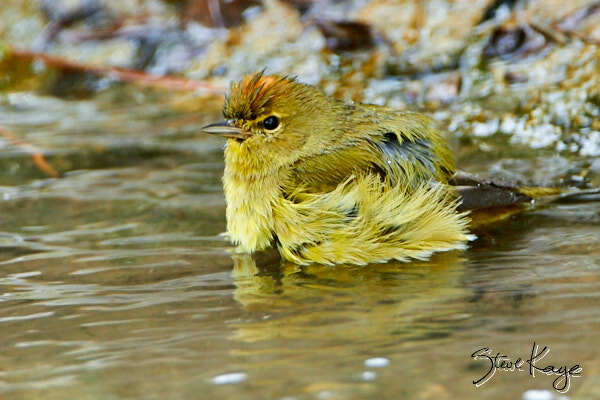 Notice (in the above photo) that it’s possible to see the orange crown on the Orange-crowned Warbler when the bird is wet. This bird will also show its crown when it’s excited. And then maybe the bird finds having its photo taken while bathing to be exciting. We’ll leave that as a puzzle for you to ponder (or talk about at your next party). 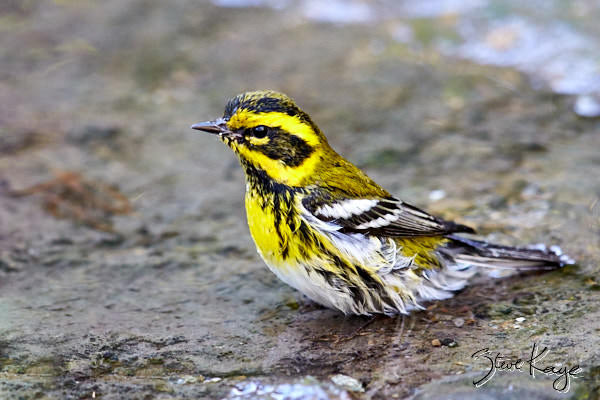 This Townsend’s Warbler is more damp than wet. So what do you prefer: Dry, Wet, Both, or Something else? So, find a small stream of gently moving, shallow water. Then pause to note if these birds are using this stream. If so, they will most likely follow a similar approach routine. For example, the birds in these photos flew into a tree next to a stream. Then they worked their way down, inside of the tree, until they were near the water. From there, they glanced about to check if it was safe to continue. And finally, they dropped into the water for a quick bath (usually lasting less than 10 seconds). Knowing this, told me where to wait and when to be ready. Here are two excellent books about warblers. Your photos and posts are so sweet and inspiring. Thank you for sharing! I wonder if they sing in the shower – or bath – or stream? Maybe not. I’ll take them any way I might be lucky enough to see them, damp, slightly wet or full-blown soggy. Thanks for the tips on how to find and observe them. I’ll try that next time I visit one of the lakes in Golden Gate Park.